As mentioned in yesterday’s post, GDP values are increasingly given in terms of purchasing power parity (PPP) rather than in nominal terms based on currency equivalents, as PPP more accurately reflects conditions on the ground. When measured on the basis of purchasing power, GDP figures for poor countries tend to increase, as goods and services are typically inexpensive in such places. By the same token, GDP figures given in PPP for wealthy countries generally decrease relative to their standings in nominal terms. Today’s post will compare depictions of global GDP variation as assessed through both methods, contrasting as well the framing of the data in both state-based and demic maps. Note that the headline map, posted to the left, shows global GDP variation in PPP as arrayed in the demic framework; subsequent maps are all twinned to allow more ready comparison. 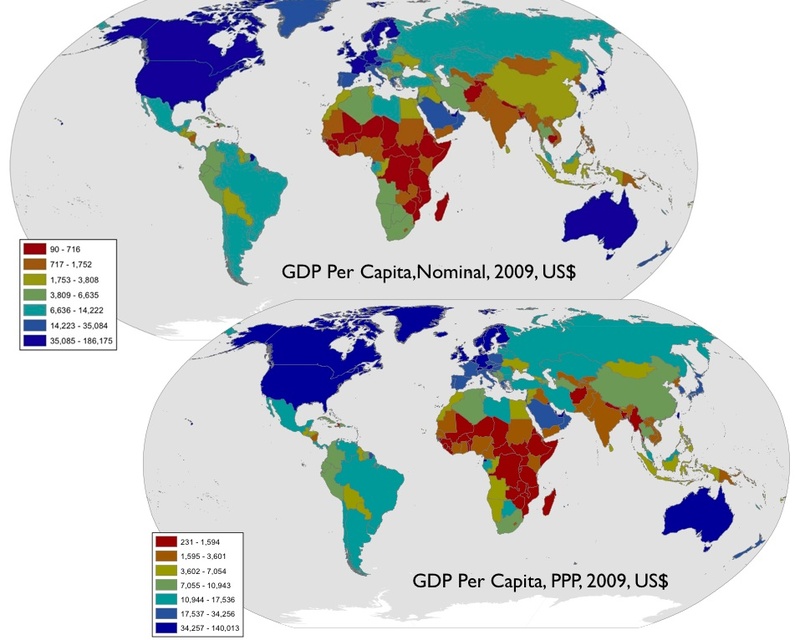 The first set of maps contrasts these two competing techniques of GDP evaluation within the standard geopolitical framework. The two individual maps, both of which divide the data by quantiles*, show relatively little variation. As is expected, some developing countries are slotted into higher categories on the PPP map, including China, Iran, and Botswana, whereas several highly developed countries end up in a lower category (France, Japan). More interesting are the states that deviate from this pattern. Burma (Myanmar), Angola, and Iraq, for example, fall into a lower color category on the PPP map. Although their actual PPP figures are still higher than their nominal figures, the discrepancies are less than what would be expected based on their overall economic situations. Such deviations can indicate irregularities in local currency valuation, best exemplified by Burma, where the kyat has long been grotesquely overvalued. Economic distortions resulting from oil-dependence can also result in lower than expected PPP figures. Angola, for example, remains a poor country outside of its narrow oil sector, yet its capital city, Luanda, is rated as the world’s most expensive city for professional-class residents. 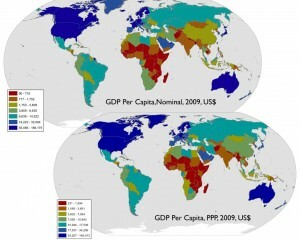 The next set of maps depicts global GDP variation within the demic framework, contrasting nominal and PPP evaluations. The differences found between the two maps are minor yet instructive. In purchasing power terms, the petroleum-rich zone in west central Africa slips down one color category, reflecting the unbalanced nature of local oil-based economies. Southwestern Europe (Iberia, southwestern France, and southern Italy) also slips a notch, reflecting the high cost of living that is often associated with the Euro. In contrast, the position of India is elevated on the PPP map, with several of its demic regions moving up one color category. ** China also sees several of its demic regions reclassified at a higher level, with both the region encompassing Guangdong and Hong Kong and that composed of Jiangsu and Shanghai bumped up to the second highest color category. In contrast, the mineral-rich Chinese demic region constructed out of Inner Mongolia, Heilongjiang, and Shanxi ends up in a lower category. 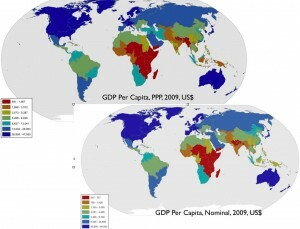 In all such cases, the PPP map seems to reflect local conditions more accurately than the map of nominal GDP. 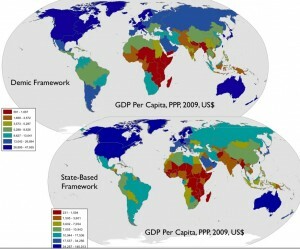 The final set of maps contrasts the depiction of global GDP (PPP) disparities in the demic and state-based frameworks. The differences encountered here are similar to those analyzed in the previous post, which examined nominal GDP in the two schemes. As a result, they are not subjected to extended analysis here. 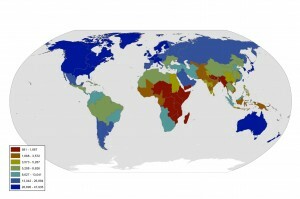 But I would again note that the demic map captures broad regional variation relatively well, but misses a number of significant local variations. As a result, it is perhaps most useful to examine the two maps in tandem. * Quantiles divide the data set at regular intervals to yield subsets of equal size. ** If we had had access to up-to-date data at the district level for India, it is possible that both the region encompassing Gujarat and western Maharashtra and that encompassing eastern Maharashtra and northwestern Andhra Pradesh would have had more elevated positions on this map.